A few WKC members got together on Sunday Feb 23, 2014 to pay a visit to Winz and his newly acquired Wood Dale Westerner. Lightning struck twice and a second Weber Westerner kettle was posted for sale in one week. It just happened to be nearby to Winz. Can you imagine the feeling of finding something so unique for sale? Winz’s score began with a desperate plea to the WKC, avoiding some grill snipers, and then finally ended by securing the deal for his collection after a tumultuous 24 hours. PBE Gummi Bear lives in the region and shamelessly asked to see the Westerner in person. A few emails and calls back and forth and it was a date! We would take some pictures of the Westerner and maybe, just maybe, fire it up. 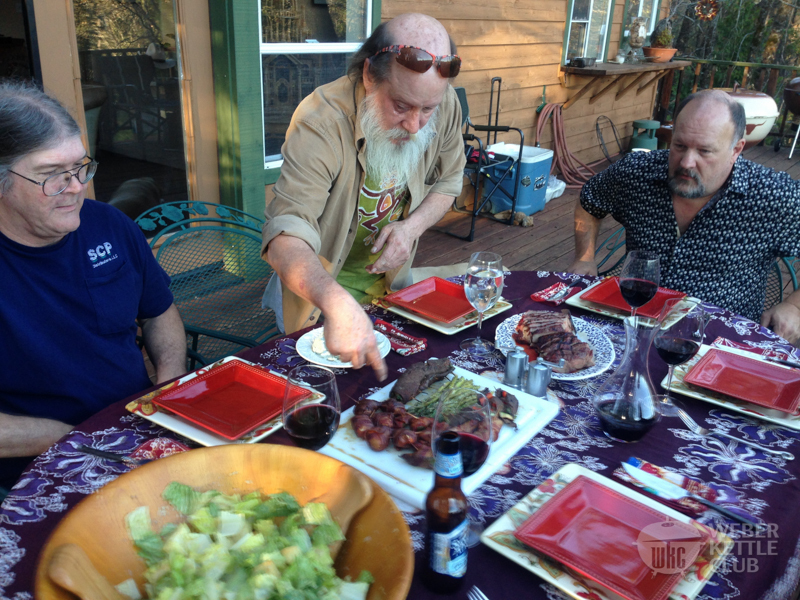 The next weekend Winz was gracious enough to invite some WKC grillfellas into his home, about 45 min Northeast of Sacramento, CA. PBE Gummi Bear, Argent flame, 1Buckie, and Mirkwood all joined in on the fun. After losing our way a bit while driving around the woods, PBE Gummi Bear and Argent Flame arrived in the afternoon. Winz ingeniously used a Jumbo Joe to mark his house, so we knew we were in the right place! Gummi and Argent Flame met a hippie with tie dye socks, long beard and bald head that was shinier than a NIB Weber kettle. Upon closer inspection though it was the turd legend himself, 1Buckie! He had gotten there before us and was just waiting for more to arrive. Mirkwood joined us a few minutes later. After the initial chit-chat meet and greet we were all eager to see the Westerner. Winz first gave us a tour of his beautiful house, as the grillfellas grew anxious to see the white whale of vintage Weber grills. He led the way to the Westerner, which was securely stored in the garage. To get there, we went around the porch, past the SS Performer, a few OTG’s and then to the garage. In the garage, there was Winz’s famous SS Performer stretched with the Extenze and wood cutting board mod. You know when you’re at a grillfella’s house when multiple kettles are part of the scenery. Without further adieu, Winz pulled the cover off for the unveiling of the Westerner. When that cover came off I swear a few of us were almost in tears. Wow, what a beauty! I never thought I would see a Westerner in real life, let alone one that was in such great condition and owned by a buddy. The Wood Dale Westerner had character and patina but was in excellent shape. There was hardly any rust and the porcelain was in good shape. Looking at the kettle more closely, the handmade craftsmanship in this kettle really shows – from the spun pattern on the bowl/lid to the fancy two-toned longhorn porcelain. Everything about this kettle was interesting- from the original U cutout ashpan, the metal lid handle, heavy duty grates, and down to the thumbscrews. They really don’t make them like they used to in the Wood Dale factory! We ogled the kettle a little more and discussed all the peculiar details about the kettle. We could have talked about it for hours but Winz had a special treat for us- We would get to fire up the Westerner with him and share a meal together! 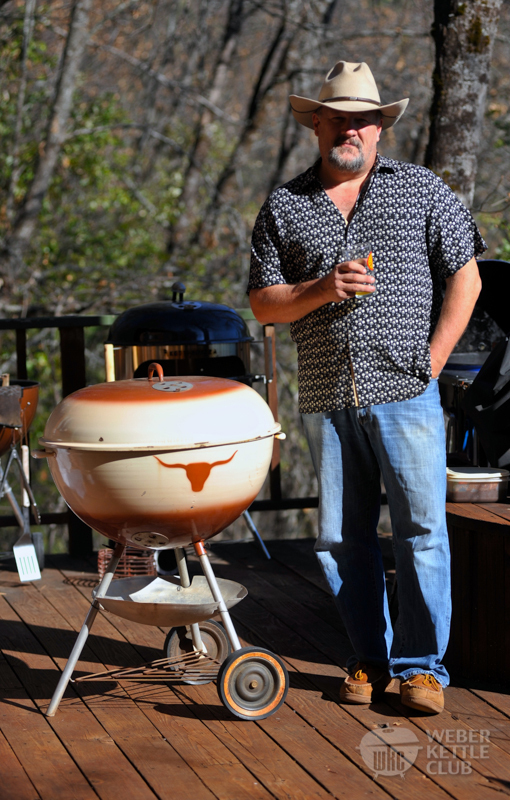 We transported the Westerner to the back porch where it would join the rest of the cooker lineup. We then spent the rest of the day enjoying each other’s company, talking about Webers, and cooking. 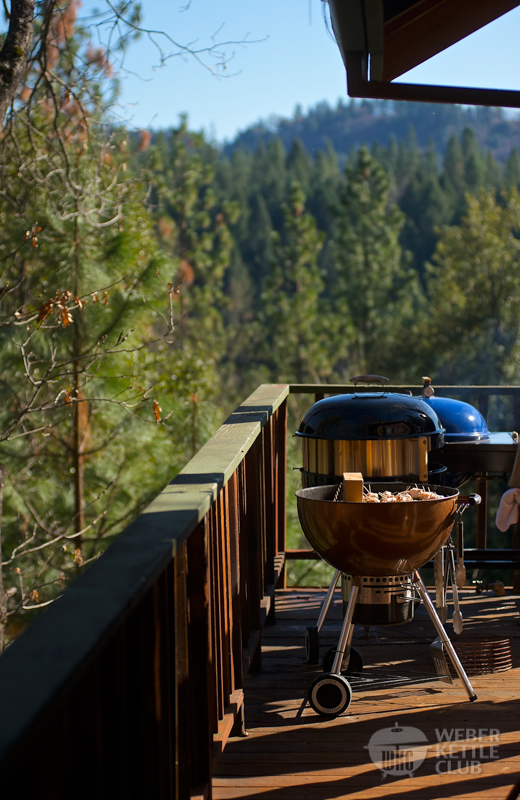 Did you know that grilling is a spectator sport? Oh yeah, I forgot to mention that 1Buckie came ready with enough food to feed an army? 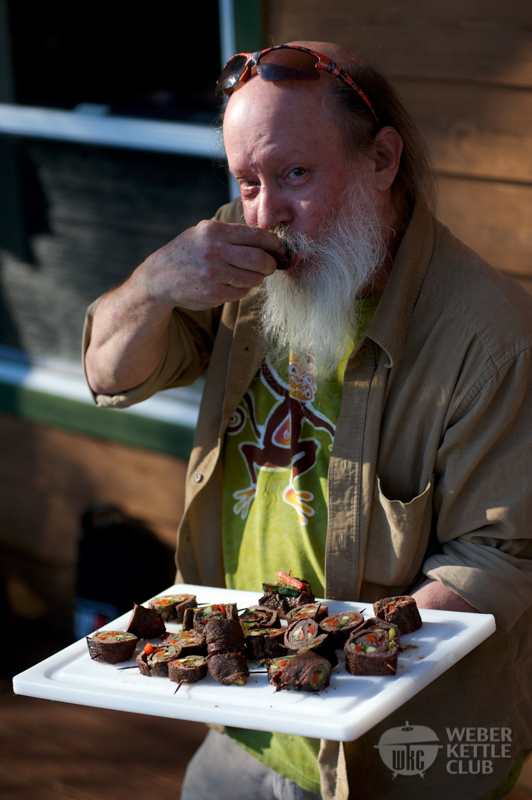 He borrowed two kettles from Winz and expertly cooked up some turds’, asparagus, and beef roll up appetizers. It was an honor to watch and be fed by the master himself. Stay tuned for a “Cooking with 1Buckie” writeup one day. 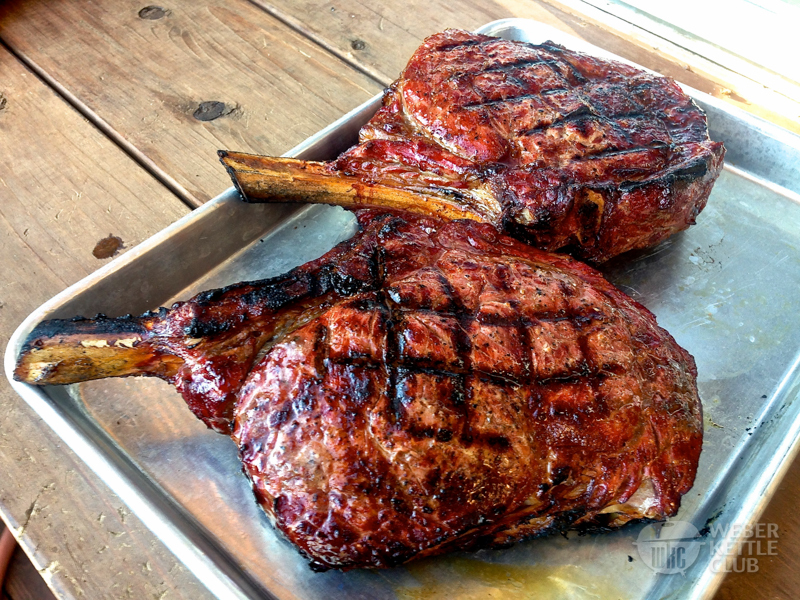 Cooking on the Westerner consisted of two big Ribeyes reverse seared on an all original Westerner and Weber sear grid. Ribeyes were the perfect meal to come off this kettle after it has been sitting unused for decades. Winz also made caesar salad with homemade dressing and Texas Toast Croutons. Do you see a theme here? Last but not least some beer and wine to wash it all down and strawberries and cream for dessert. 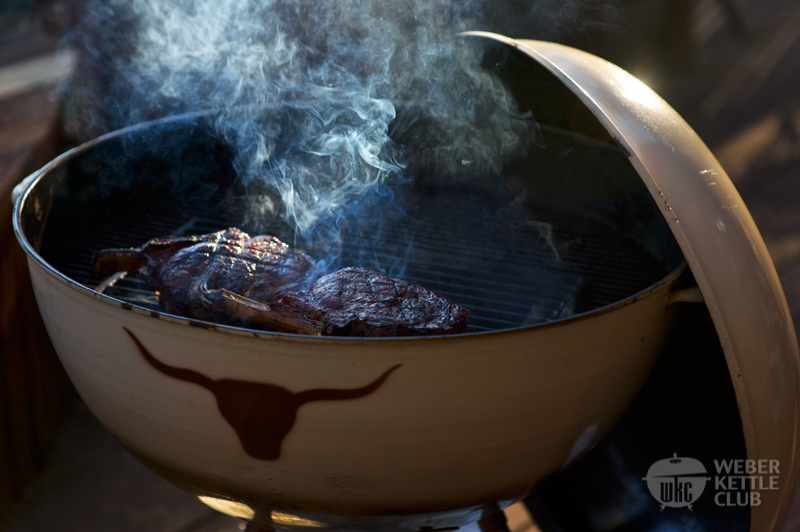 A searing steak never smelled so good…..
Here’s your dinner. No plated pics. You can tell the food is good when even the photographer puts down the camera to eat! 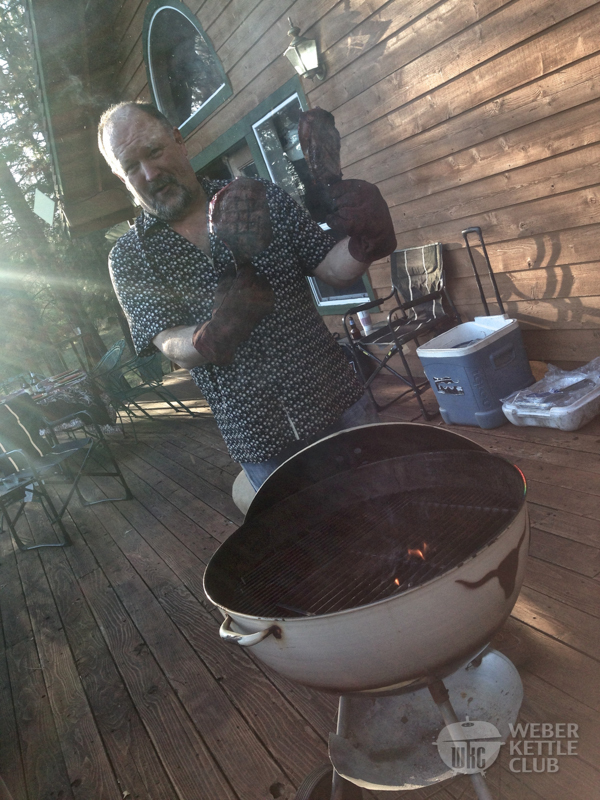 I would like to thank Winz for letting the WKC partake in his experience of obtaining the Westerner and hosting a few grillfellas for it’s first cook. I don’t think anything will quite compare to the experience I had that day making new friends and firing up a Wood Dale Westerner. Thank you Winz, 1Buckie, Mirkwood, and Argent Flame for the awesome day! 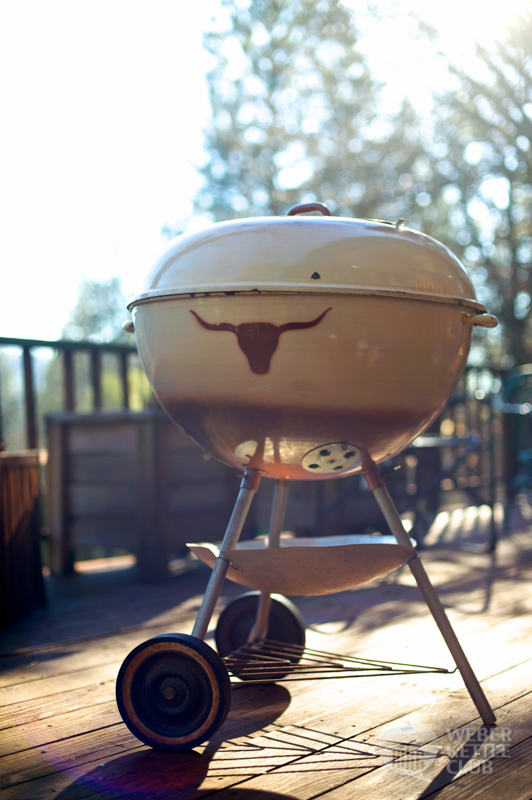 Winz comments: The most wonderful thing about owning any Weber, much less a vintage one. 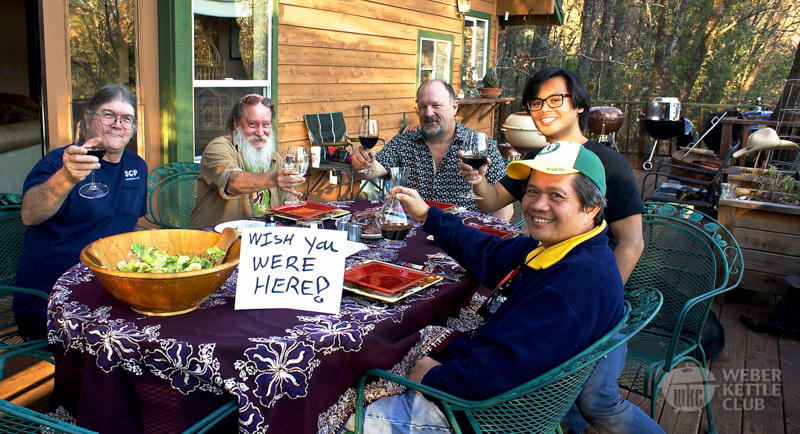 is the chance to get friends and family together for a meal and to enjoy each others company. 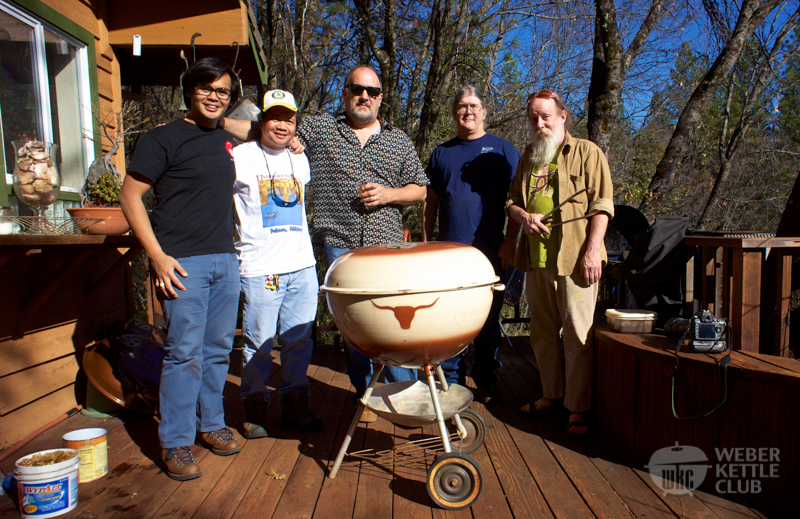 This day was something special – a chance to make new friends and to display the camaraderie that exemplifies the WKC while cooking some good food over a 50 year old Weber kettle. A special thanks to Argentflame and PBE Gummi Bear for breaking the norcal 30 minute limit to make a 4 hour round trip drive to my place. Thanks to mirkwood for putting all other plans aside and hanging out with us for the day. 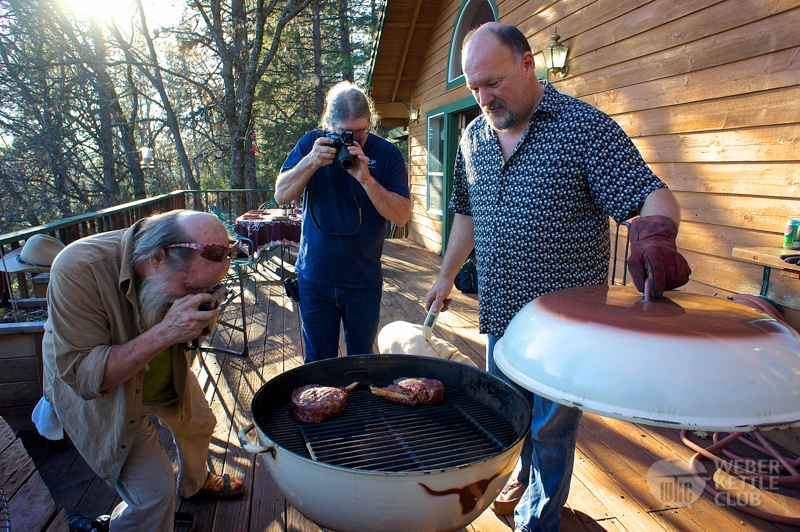 It was an honor to both meet 1buckie and to watch him work his magic – the guy has forgotten more about cooking on a Weber than most of us will ever know. He left all that attended a special bottle of his favorite marinade. And a special thanks to Gummi for bringing me a Westerner “welcome present” consisting of WKC swag and a new 26” grill grate, but most of all, for the amazing pictures you are viewing. The guy has skills. Spectacular way to celebrate the acquisition of your beautiful grill Winz! It is obvious that everyone had a great time. I am jealous! Just reading this now. What a great time you guys had. That is some spread you have there Winz….and that Kettle is beauty.